Space ship-based beat ’em up In Space We Brawl will be released this coming Tuesday on the PS3 and PS4. A couple of months back we covered the announcement of In Space We Brawl, a beat ’em up/twin stick shooter/space ship customization game from indie studio Forge Reply. It was announced exclusively for Sony platforms — specifically the PS3 and PS4 — and in the time since then nothing has changed that. What has changes is Forge Reply’s official announcement yesterday of the game’s imminent arrival: In Space We Brawl will be made available via PSN on both the PS3 and PS4 on Tuesday October 14th. For those who missed it the first time around, In Space We Brawl takes the simple gameplay of games like Robotron or Beat Hazard, amps it up a notch, then adds relatively deep ship customization, all before dropping you into a free-for-all with up to four friends, where the goal is simple: smash, shoot, and blow up your opponents before they do the same to you. The game has come along a ways since then, with the game’s main site adopting lots of GIFs and animations that will play heck with a slow internet connection but still help to demonstrate some of the game’s interface elements and the like. What it all boils down to is if you took the early 80’s games Asteroids and Warlords, coated ’em in HD paint, and let people choose their weapons of mass destruction. 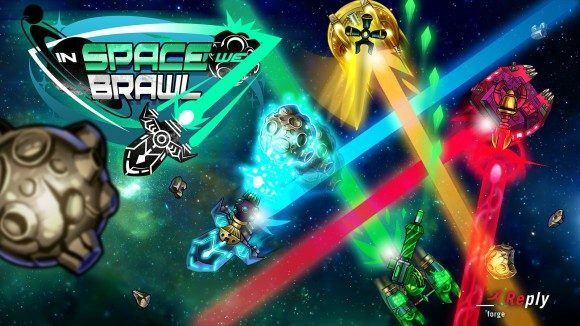 When In Space We Brawl launches on Tuesday the game will be available for $11.99 US. PlayStation Plus members will be eligible for a 20% discount for a limited time (though how limited their announcement fails to say.) Best of all, the game will support cross-buy, meaning that a single purchase of the title on EITHER console will make it available on both.